Now imagine a world in which you carry such great happiness and love in your heart, only to discover one day....that it's not true. Or more accurately, that it's not yours. It isn't your love at all. Rather it is an illusion, and the love you carry is but the "property" of someone else, another individual. 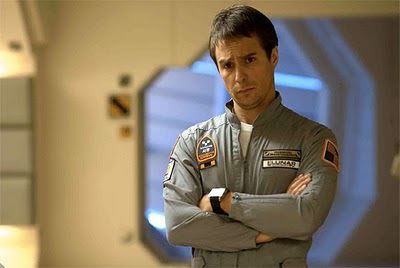 In broad terms that's the crux of the understated and haunting Moon (2009), a science-fiction film starring Sam Rockwell, written by Nathan Parker, and directed by Duncan Jones. Moon is set in the near future, primarily on a moon base called Sarang that is busy producing Helium-3, the miraculous new energy source needed down here on Earth. Manning Moonbase Sarang is one lonely, strung-out astronaut, Sam Bell (Rockwell). Sam is rapidly nearing the end of his three year contract, growing a little loopy from passing the hours alone, and he spends much of his day chatting with the base's ambulatory computer/robot, Gerty (voiced by Kevin Spacey). But Sam longs to return home to his beautiful wife, Tess, who periodically sends him recorded video messages. Sam also has a beautiful little daughter, Eve, that he misses desperately. In two short weeks, he can resume his life with them, he believes. That's the only thing he is holding onto. Sam is so excited about returning to his family that he ignores some odd events going on around him. Like the fact that the large diorama/model he's worked on for 938 hours was actually begun before he arrived at the base. Sam also ignores the phantasm of the girl in the yellow dress, and jolting video images of himself that seem to sparkle to life and then vanish on his view screen without rhyme or reason. He doesn't seem to worry much, either, that he can never, ever get a live feed transmission back to planet Earth. Then, one day, there's an accident on the lunar surface involving one of the powerful energy harvesters. Sam is injured in a lunar rover and suddenly things take a turn for the truly weird. Somehow, Sam is returned safely to Sarang's infirmary. Who rescued him? How did he get there? Why can't he remember the specifics of the accident? Upon recuperation, Sam overhears Gerty talking to officials of the LUNAR Corp. in hushed, conspiratorial tones...even though supposedly there's no available live feed to Earth. Then the officials abruptly decide to send a rescue mission to recover Sam before his tour of duty is over. Why? What is the real reason the enigmatic "Eliza" rescue team is moon bound? Finally, Sam meets someone on the lunar surface, in the wreck of the lunar rover, and comes to realize that he's been a patsy in someone else's game for a long time. That reality is nothing like he had imagined it to be. I don't want to write too much more about Moon's plot except to say that it is fascinating, and lives up to Outland's (1981) famous ad-line: "Even in space, the ultimate enemy is still Man." And that allusion to an older science fiction film -- one set on a moon base orbiting Jupiter -- leads nicely into a discussion of Moon as dedicated homage to the outer space film tradition of the late 1960s-early 1980s. I'm not talking about the swashbuckling Star Wars adventure tradition here, but something else entirely: the sort of "man alone"-confronting-the-mysteries-of-existence tradition. These are films and TV installments that focus on the details of our near-future space "tech" or hardware, but also on the condition and future of the man who operates it. It's not the holodeck/transporter room/bumpy-headed tradition of latter-day Star Trek, either (not that there's anything wrong with that...). But here, life in space is extremely difficult, and one little mistake means instant death. Accordingly, Moon references a number of respected older productions. Alone on his job, going slightly bonkers, Sam might well be Bruce Dern's Freeman Lowell in Douglas Trumball's Silent Running (1972). 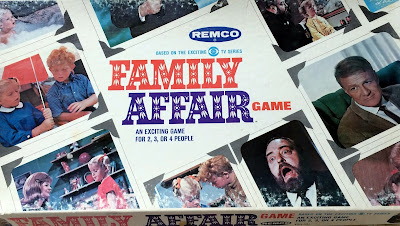 There, Dern's character -- the only human aboard an agro-freighter called The Valley Forge -- had only three drones (Huey, Dewey and Louie) to converse with and play poker with. Here Sam has the company only of the computer, Gerty. Dern's character was also put in the position of disobeying orders and attempting an escape of sorts. Sam's journey mirrors that aspect of Silent Running too. There's also a reference in Moon to 2001: A Space Odyssey (1968). Remember the scene in Kubrick's masterpiece which featured Dr. Floyd arriving on the space station and telephoning home to wish his daughter a happy birthday? There's a recorded birthday call between Sam and his daughter here too. It's interesting how the same idea is re-purposed in an original way by Jones. In 2001, the phone call represented a marvel of communication: a way for humans to stay close across vast distances. In Moon, the call represents precisely the opposite: Sam's distance from his family. The recorded message allows no real back-and-forth. It's only a reminder of what's lost: real-time contact between father and daughter. And, viewers familiar with Outland (1981) will instantly recognize the over sized, digital countdown clock ticking away to the "rescue" shuttle's arrival at Sarang. A similar clock counted down the arrival of a supply shuttle at Io in the older film. But that Outland shuttle was really carrying a team of assassins to murder troublesome Marshal O'Neil (Sean Connery). Likewise, the countdown clock serves the same purpose in Moon: building suspense, and carrying assassins bent on murdering poor Sam. In both cases, an individual (O'Neil or Sam) has stepped out of the prescribed order, learned a secret, and must be dealt with before the population-at-large discovers the hidden truth. There are even some similarities in shuttle design in the two pictures. Right down to the smallest details, Moon echoes the outer space thrillers of yesteryear. One Purina-style logo on the computers comes right out of Alien (1979), as does the frequent talk of work "contracts." Also, the company LUNAR -- which runs the moon base -- is of English/Asian origin, just like nefarious Weyland-Yutani. 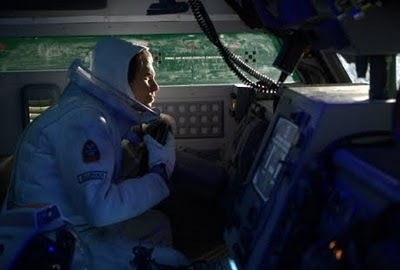 And Sam's discovery of a body on the lunar surface -- wiping ice away from the face plate of a space suit -- also refers back to a haunting image from the classic Space:1999 (1975-1977) episode titled "Another Time, Another Place," and it's actually the same discovery: the horrifying vision of a corpse that can't possibly be a corpse. In that Johnny Byrne episode of Space:1999, the discovery involved alternate worlds and alternate selves. Moon boasts a resonance of the latter element. Lastly, and perhaps most importantly, the film's plot and resolution come around to echo Blade Runner's (1982) central them: the idea of man playing God with living beings who feel, think...and love; mankind tampering with life-spans, memories, and emotions. 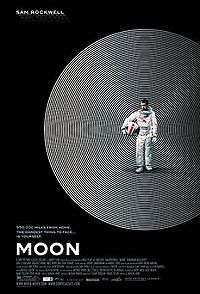 What I found so consistently intriguing and delightful about Moon is that although it indeed alludes to all these great productions of the late 1960s-1980s, it isn't a remake, a re-boot, a re-imagination, a "brand," or a sequel. While cleverly aping the austere, minimalist visual style of 2001, Silent Running and Space: 1999, director Jones nonetheless weaves an original and thoughtful narrative. It's one that -- like Silent Running, Solaris, Blade Runner, etc. -- asks important questions about what it means to be a human being in the technological, "space age." And Moon also questions whether love is something we can transfer -- perhaps through osmosis, perhaps through programming, perhaps through cloning -- to our creations. Gerty is one answer to that question. Jones teases us throughout the film that Gerty (a robot with a 1970s yellow smiley face screen...) may be as secretive and manipulative as Kubrick's HAL 9000. The truth is somewhat different...and ultimately affecting from an emotional standpoint..
Gerty lives up to his programming, but it's implicit that he's doing something more than that as well. He boasts an (apparent) emotional bond with Sam that goes well beyond company directives and protocols. I mean, the robot understands the concept of self-sacrifice. So Moon seems to suggest that man and machine, clone and robot, are more than the sum of their "constructed" parts. When we dismiss such things out of hand, it makes us all...less human. It diminishes us all. Interestingly, Moon opens by explaining that we have conquered our energy problems. A voiceover narration informs the audience "there was a time when energy was a dirty word," for instance. But after optimistic talk of this great breakthrough, the movie then it goes on to tell Sam's story; a story of a corporation that has made moral compromises to achieve that breakthrough. A Space:1999 episode of the 1970s ("Dragon's Domain") noted that "space adventuring is terribly expensive" and that "the opportunities" come "one at a time." Moon acknowledges that reality: watching the bottom line, LUNAR has assured that no humans will die on the moon; and that no interruption of the energy flow will occur either. But the way the corporation has achieved this end is both deceitful and immoral. Moon is a sturdy, introspective, highly-intelligent meditation on the near-future trajectory of humanity. When we go to the stars, how will we treat the men and women who represent the vanguard? How will we replace people who are injured? How will we assure that those astronauts remain psychologically sound during a long span alone, isolated? Moon finds answers -- and it also pitfalls -- in LUNAR's solutions. 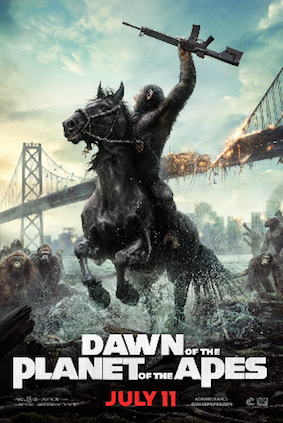 The film is not a shoot-em-up, it is not a blockbuster, and it is not a crowd-pleaser, either. The location may be "space," but the approach is entirely human; entirely grounded. The last film that attempted this alchemy was Solaris (2002), and I remember how vehemently modern audiences hated, hated, hated it. It's easier to tell a sci-if story about light sabers, aliens, and rampaging robots than it is about the condition of the human heart, I suppose. By some way of thinking, Moon is even a love story: an impossible love story. Moon is a space epic all right, but it is an emotional epic. And no, that desciption needn't be a contradiction in terms. Love this Duncan Jones film debut. For a small film and cast it out-performed many bigger budgeted Hollywood films in what sci-fi fans love about this genre, having a heart and a mind along with an imagination. Fine review, John. John very insightful review of Moon. I agree with your thoughts on this fascinating film that truly has the minimalist visual style of 2001, Silent Running and Space: 1999. It ultimately has a Twilight Zone style ending regarding the character of Sam. Shoot, sounds like you also draw parallels with Saturn 3 and Aliens (the first part, not the mission). I'd like to point out that the bulk of the special effects are all practical model effects, not CGI, and they look amazing.